Sevillana de Patatas, S.L. was founded by Francisco González Arrebola, who began the activity in 1965. With more than 45 years of experience, our company is leader in the management of production and commercialization of early potatoes. During these years of activity, the company has built a realiable relatioship with a wide range of farmers selected by their professionalism, and its technical and operative capacity. In the same way, the company works with the best suppliers of seeds and agricultural inputs. We have been also improving our work methodology, under the more demanding standards of quality. 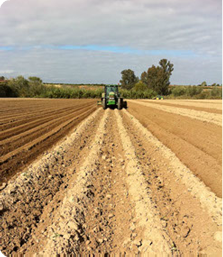 Our technicians advise and control the production of the crops from planning to harvest and distribution. This way we guarantee to our clients the reception of goods at the best conditions. On the other hand, over the years the company has also selected a portfolio of national and international clients, noted by their professionalism and solvency, with who we have a solid relation based on the mutual confidence. Everything we do, we do it with the objective to satisfy our farmers and clients.